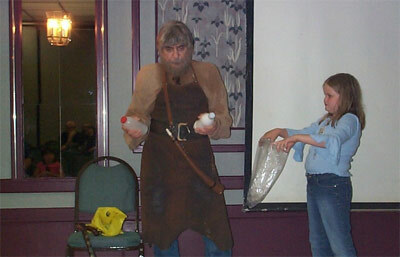 Ygor (Michael Thomas) does magic tricks for the kids on stage before Saturday Morning Cartoons at Monster Bash! 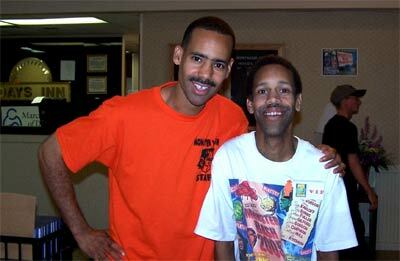 Monster Bash projectionist Geoffrey Curtis and brother Eddie. Creighton and The Mad Doctor from Ghoul A Go-Go getting the kids dancing on stage (before the tour of the Hickelberries plant). 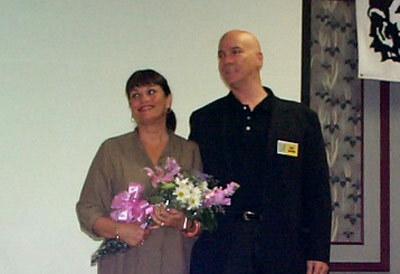 The children of actress Anne Gwynne: Gwynne and Greg Gilford on stage. 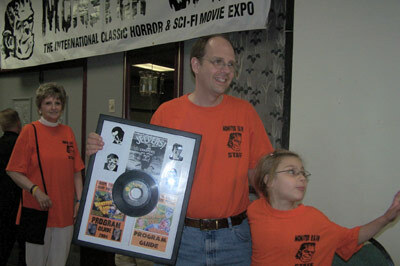 Gerry Goodwin presented Ron with a "Monster Mash" framed record. 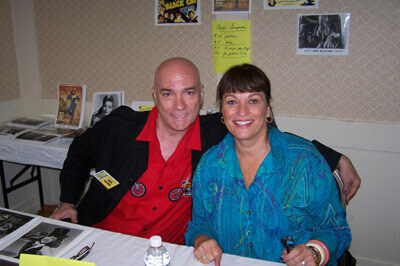 Greg and Gwynne Gilford at in the Guests of Honor room at Monster Bash. Greg was a popular charting musician with his band back in the 1960s and Gwynne went on to act in BEWARE - THE BLOB and other projects. 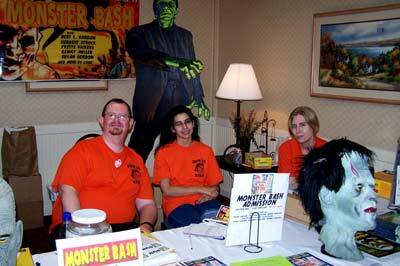 A good time is had by all Saturday night at Monster Bash. 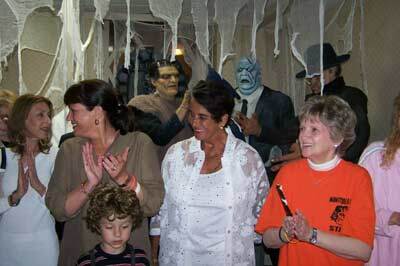 Note - Ben Martin's son dressed up as Donnie Dunagan from the SON OF FRANKENSTEIN, front left. 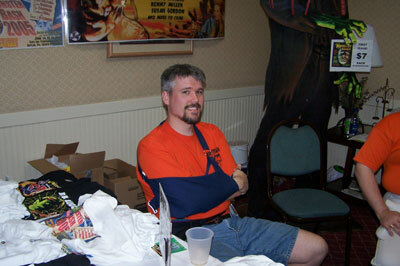 Bash staffer Harry Hatter (along with Kevin Surnear) manages the Guests of Honor room at Monster Bash. I don't think we got any photos of Kevin this year. Send it in, if you have one! The monster swings Inspector Kroghs arm. On the left, magazine cover artist Basil Gogos looks on. 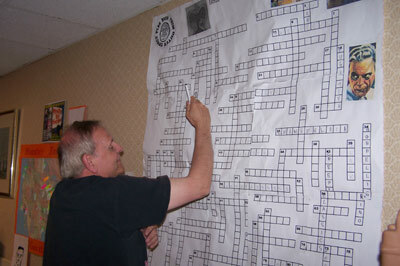 The Monster Bash Wall Puzzle, engineered by Barb Heiss. 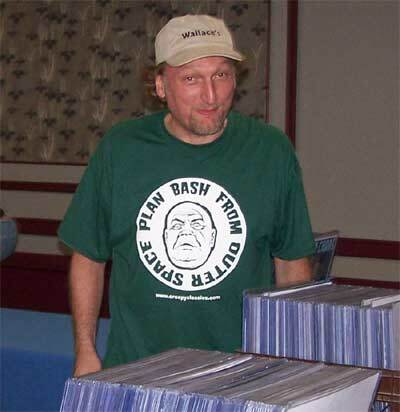 Pictured: Jack Linendoll figuring a question out. 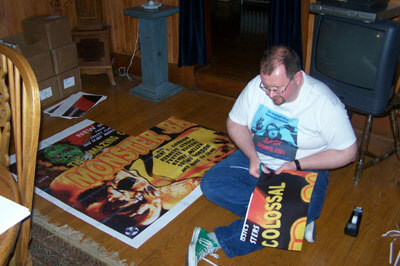 A behind-the-scenes shot of staffer Jeff Barnes working on a banner. Jeff manages the Monster Bash Yahoo Group. Welcome to Monster Bash! Registration staffers Jeff, Ursula and Lee Ann. 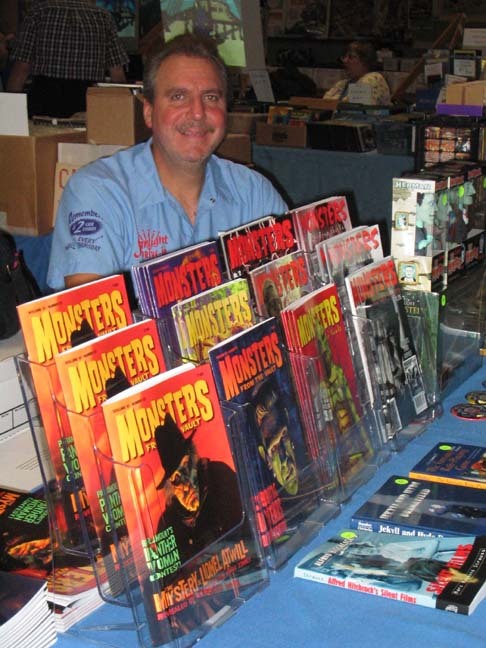 In the Monster Bash Dealer Dungeon - Jim Clatterbaugh rocks with his magazine Monsters From The Vault! 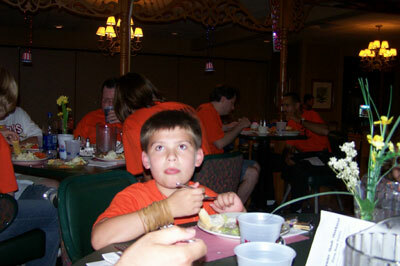 Monster Bash staffer John Adams in the restaurant. 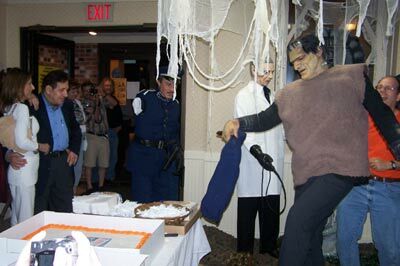 Monster Bash staffman John Doerr of Hollywood Hounds Movie Posters works registration with one arm in honor of Inspector Krogh. 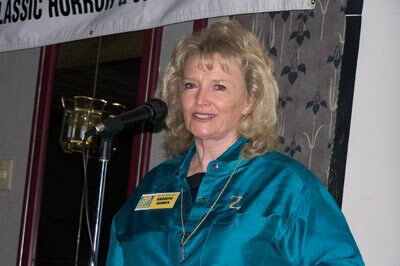 Zu Zu from the movie IT'S A WONDERFUL LIFE (Karolyn Grimes) lends her wonderful personality to Monster Bash. Monster Kids of all ages enjoy the fun in the Monster Bash Movie Room. 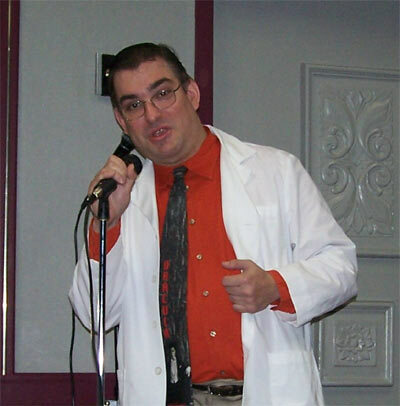 Genre writer Leonard Kohl, sporting his mad doctor lab coat, introduces chapters from FLASH GORDON CONQUERS THE UNIVERSE.